You can see Independence Highway through this parked culvert. 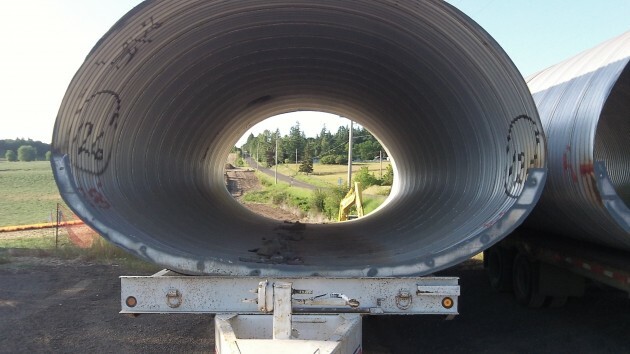 Drivers on Independence Highway in Benton County may have noticed two sections of steel culvert parked at the county stockpile site on Independence and Ryals Avenue. Next week the county plans to install them to replace what it says is a failed culvert where the highway crosses Bowers Slough, a few hundred yards south of the storage site. That’s why that segment of the highway will be closed for most of the week starting Monday, June 16. Trucks will be detoured on Highway 99W or Spring Hill Drive, depending on where they are going or from where they are coming. Passenger traffic will be encouraged to go around the closed section on Metge, Oak Grove and Palestine. Benton County Public Works says the culvert replacement is costing about $45,000.